Skills: Numbers in Base Ten, Subtracting multiples of 10 mentally, Use number grids, base ten blocks, drawings, or ten frames, Explain how the strategy they chose to subtract 10 can help subtract multiples of 10 quickly. Materials Needed: Student whiteboards, eraser, dry erase marker (1 per student), pencils, base ten blocks (tens only, 9 for demonstration and 9 per student or pair of students – if not enough, use whiteboards to draw base ten blocks), large class 100 grid, dice, brads and paperclips, and a document camera or whiteboard. Printable Resources: Required Printable Resources: “Student 100 Grid" (1 copy per student), “Take Away 10” (1 copy per student), “Spin and Subtract” (1 copy per student), “Ten Frame Take Away” (1 copy per student), and “Roll and Subtract” (1 copy per student). Optional Printable Student Resources: “Exit Slips” (1 copy per student), and "Break up Your Day" (1 copy for teacher). 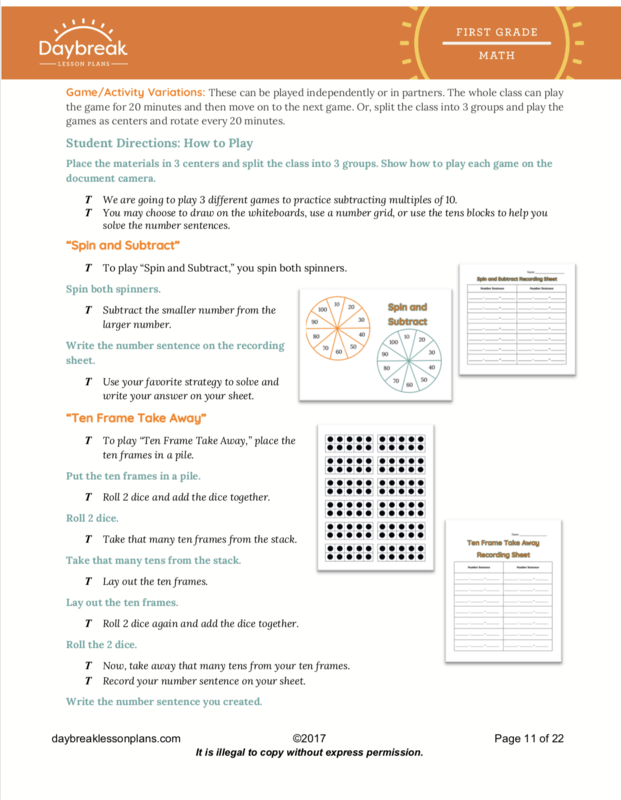 In this fully scripted 2 segment, 2 hour lesson, 1st grade students will subtract multiples of 10 mentally using a variety of methods including a collaborative game, explain the strategy they chose to subtract 10 and how place value can help subtract multiples of 10 quickly. 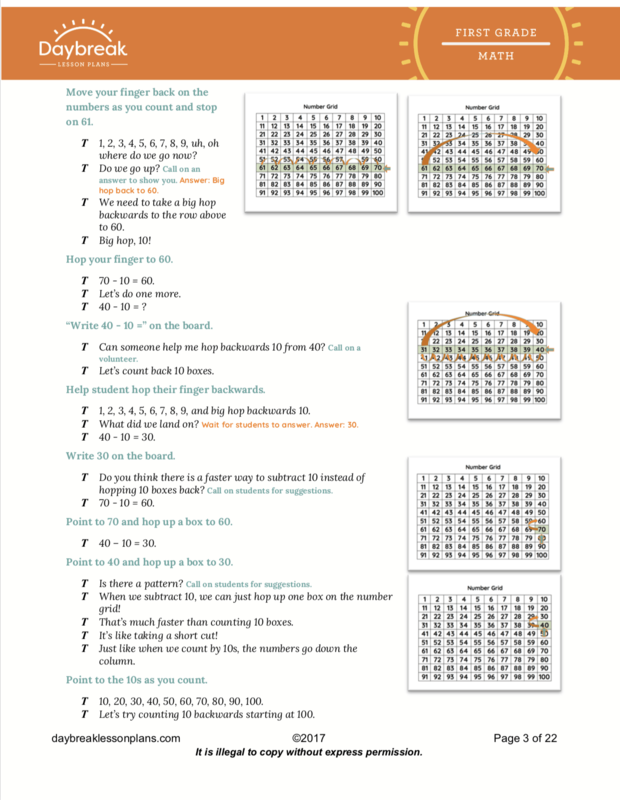 In Segment 1, student will practice subtracting multiples of 10 using number grids, ten blocks, drawings or ten frames. Using a gradual release model, students will be guided through understanding the value of using 10’s when adding or subtracting. 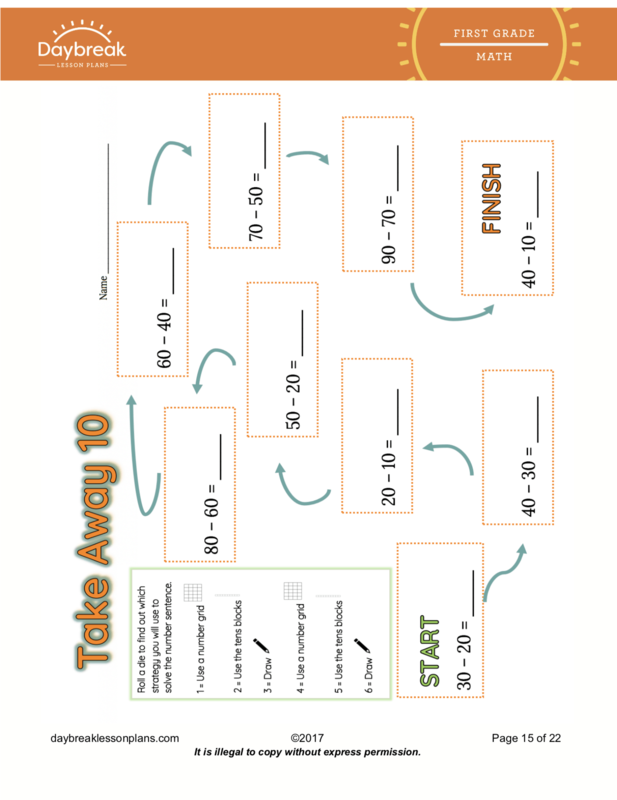 In Segment 2, students will play a game, “Take Away 10” to demonstrate their understanding of mental math using 10’s. 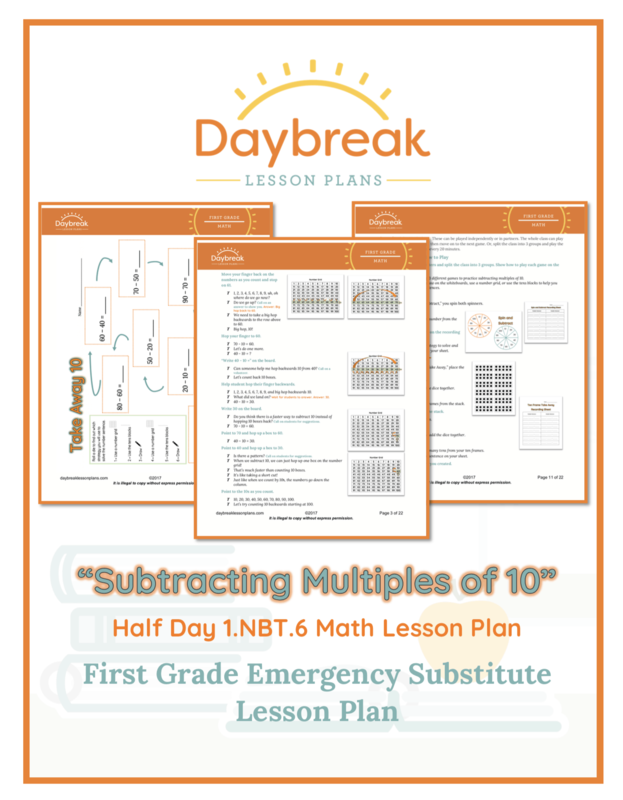 This lesson includes an exit slip that will provide valuable instructional information to you regarding your students understanding of adding and subtracting using 10’s.